The best evidence for a central dark mass of a few million solar masses comes from near-infrared (NIR) studies with ground-based 8-m class telescopes, where the development of adaptive optics has provided the ability to track the motions of individual stars orbiting around Sgr~A* over several decades. So far, about 30 stellar orbits have been monitored in the center of our Galaxy, by two independent groups, one at the MPE in Europe using the ESO-VLT telescopes and one at UCLA in USA using the Keck telescope. [FIGURE/VIDEOS]. These measurements have provided a unique opportunity to map out the gravitational potential around Sgr~A* with high precision and demonstrated that this potential, in the central tenth of a parsec of the Milky Way, must be dominated by a single point source of a few million solar masses. 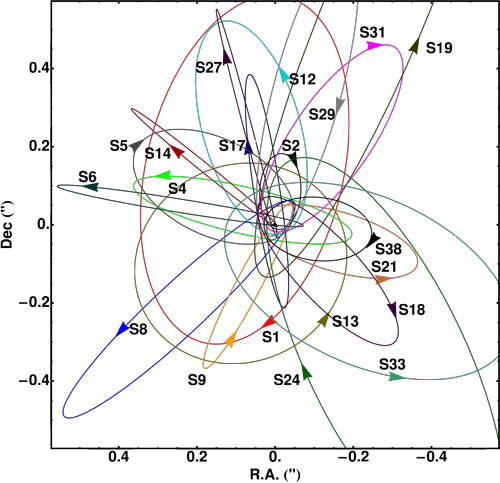 However, owing to the relatively large orbital distances of the currently known NIR stars around Sgr~A*, there have been no dynamical measurements of its spin magnitude or orientation. In fact, relativistic effects that may enable the measurement of the spin and eventually a test of the no-hair theorem, are generally too small to be detected in the current experiments with single 8-m class telescopes. But these effects will come in reach through precisely measuring the orbits of stars with GRAVITY, a second-generation instrument on the Very Large Telescope Interferometer (VLTI), which is an adaptive-optics assisted optical interferometer. 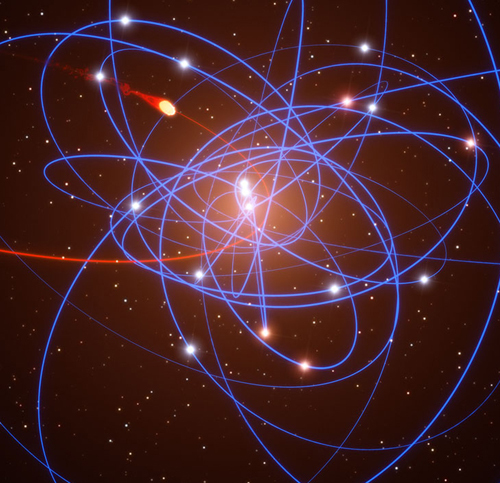 By providing astrometry with a precision of the order of 10 microarcsecond and imaging with a resolution of 4 milliarcseconds, GRAVITY will be able to monitor stars with tighter orbits around Sgr~A* (within a few hundreds gravitational radii). This will offer us the possibility of measuring higher order relativistic effects, like the Lense-Thirring precession, and/or test the no-hair theorem.